After spending a few days in Bangkok on my own (Craig has been working), I decided it was time to be a little more social and a tad more adventurous and headed off on a tour. 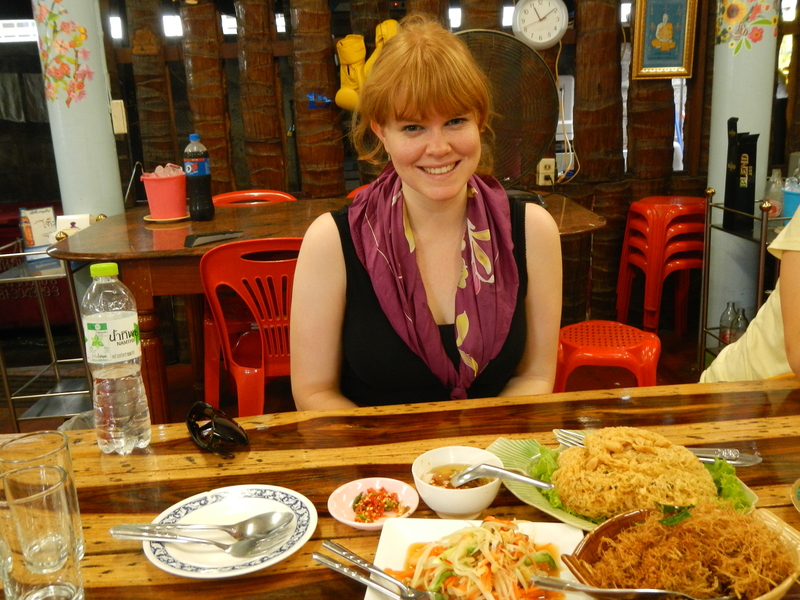 I had read up on several different options and eventually settled for a combined Food and Bike Tour of Bangkok. I met my food guide Nushi from Bangkok Food Tours, at the Saphin Taskin Train Station around 9.30. It was already about 30 degrees and sweat was dripping down my back. Hmmmm, is anyone else thinking that a walking tour may not be such a great idea? I was joined on the tour by an Australian Couple and a New Yorkian. The Thai people on the whole are kind and friendly and the country is nicknamed “the Land of Smiles”, a smile showing a few teeth gets you a long way here. 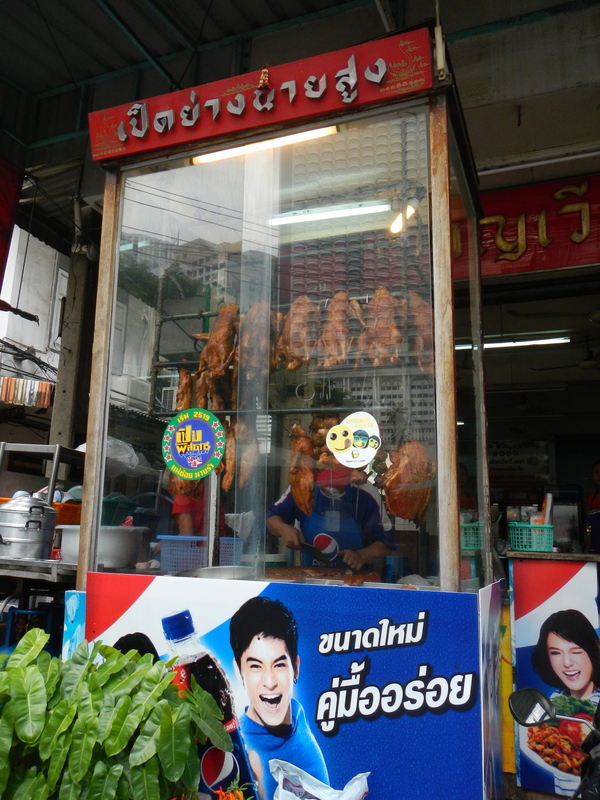 We wove our way through the busy streets and started by visiting a third generation restaurant serving Thai Roast Duck on a little side street in Bangrek. 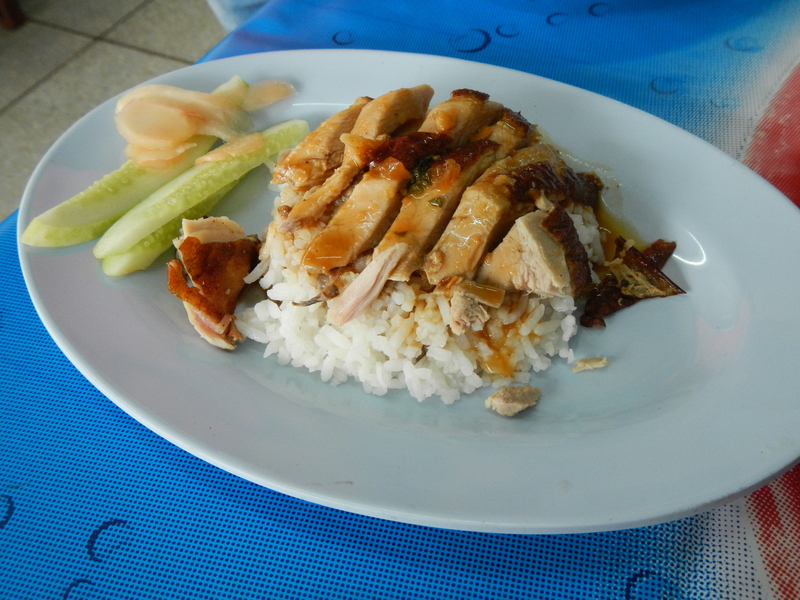 Nushi told us that Thai Duck is quite different to Peking Duck, as it is allowed to run free, which makes the meat leaner and I think more tender. The duck was beautifully cooked and served drizzled with a honey sauce. YUM! Lucky I had not eaten much breakfast. Sadly we left our cool seats under the fans in the restaurant and braved the heat to head to our second stop. 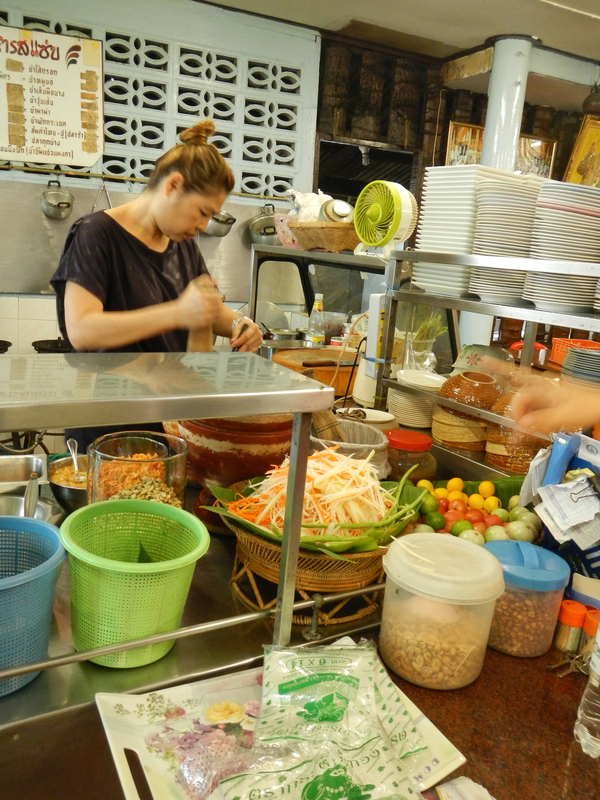 This restaurant has also been in Bangkok for over three generations, initially started by an Indian man who immigrated to Thailand and married a Thai woman. It is now under the ownership of his great, great grand daughter, who continues to make the same recipes. 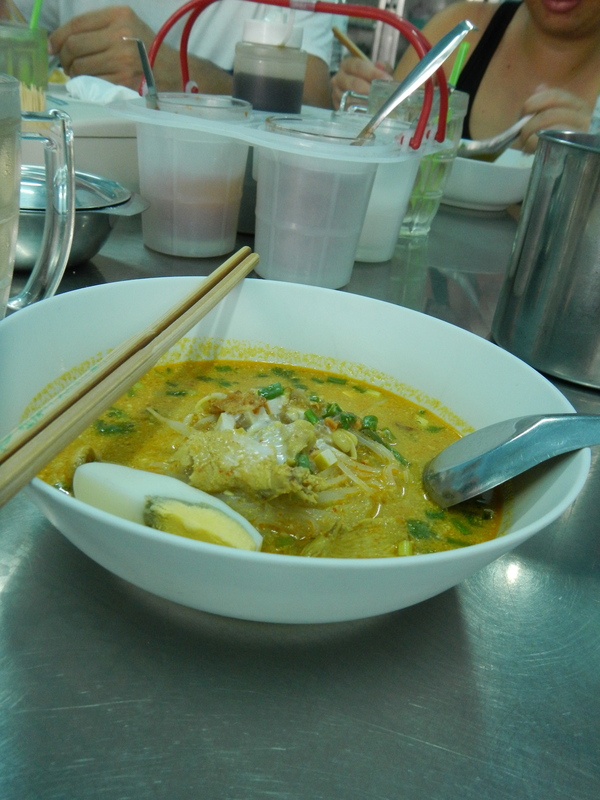 We tried Curried Noodle soup, it is soup made with coconut milk, chicken, and tastes similar to a laska. From here we continued our food tour, visiting a Buddhist temple, where there is also a school. Gorgeous little children were all lined up, giggling and chatting ready to wash their hands for lunch. Some things never change. Our third stop took us by ferry across the Chao Phraya River, to Thonburi. A lot of Thai people choose to live in Thonburi as it is significantly cheaper than Silom or central Bangkok. The ferry fare is only 3 Baht per trip and the Sky Train stations are normally within easy walking distance. We carefully made our way through a narrow alley, where doorways lead off to houses, and food stalls are set up on the side of the alley. Boards cover the drains where rubbish has piled up and wafts of putrid air hit you. But further along the alley is a lovely little restuarant. All food is prepared by the matriach and owner of the restaurant in front of us. 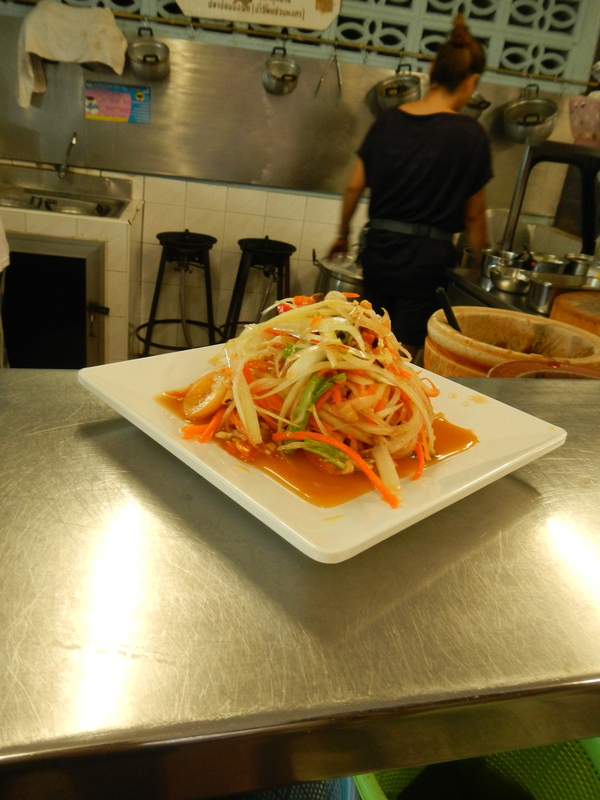 Here, we ate Fried Catfish with a spicy mango dressing, green tomato and papaya salad, a mint infused pork dish and chicken with deep fried lemon grass. Simple dishes but they pack a hit of flavour. Hmmmm, Let me at it! 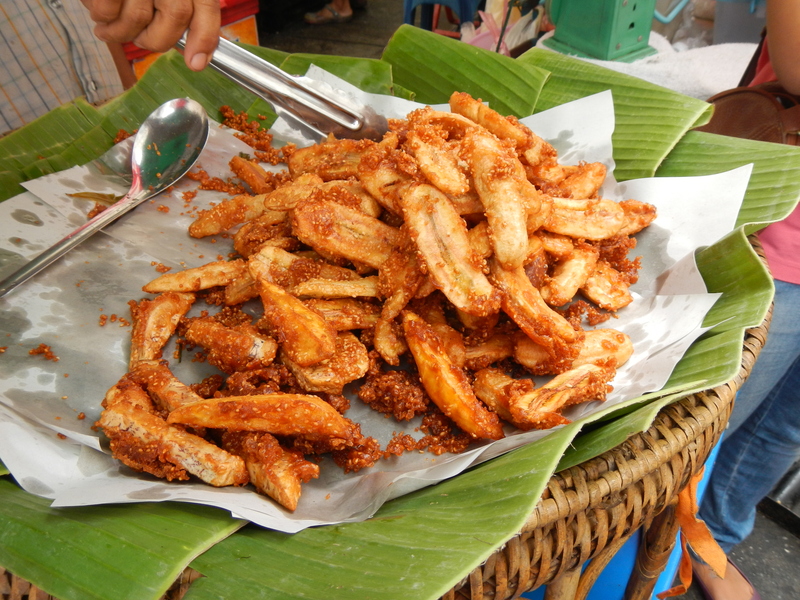 As we wandered back from the ferry towards the Chinese Bakery which was our forth stop, we tried some fried bananas and taro coated with white sesame seeds. Crunchy and delicious they melt in your mouth. 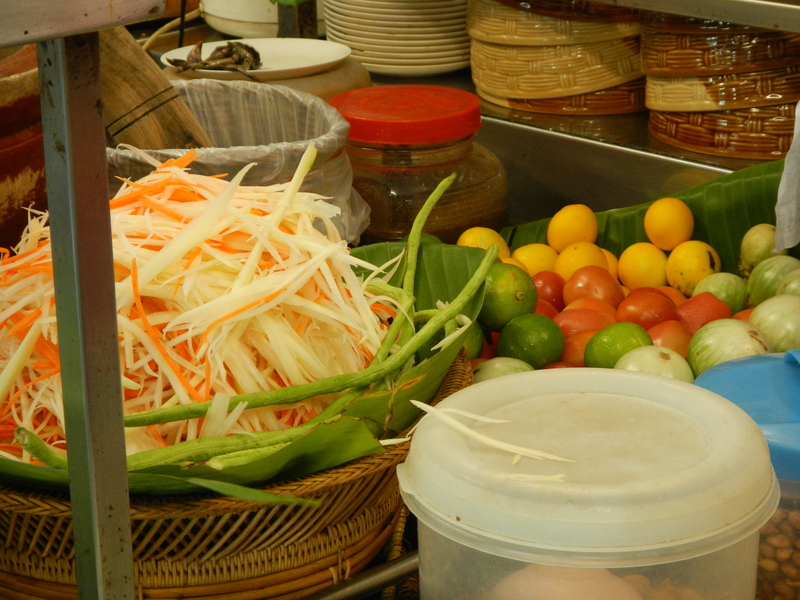 A pork bun, and Pandanus Custard Bun accompanied with a traditional Thai Iced Tea awaited us at our next stop. 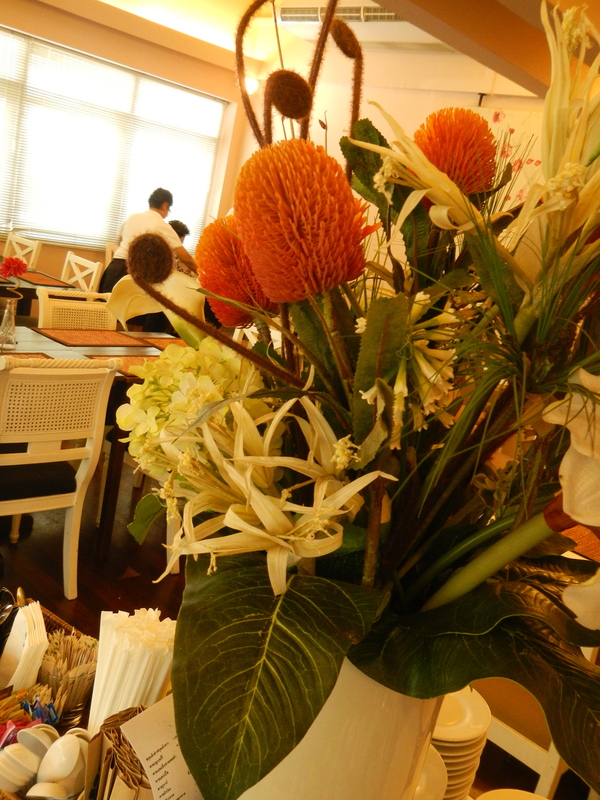 Pandanus leaves are used to flavour many different Thai dishes and produce green coloured desserts. The leaves are also used to create hand crafts and fresh leaves are kept in cars as a type of air freshener. The Pan Asia Bakery has been in Bangkok for several generations as well, and is visited by locals for their daily Bakery treat – either sweet or savoury. Our last stop on the tour was in Silom, owned by a member of the Royal Family (the Son of the Previous King), he has reinvented the Green Curry. He serves it with Roti. 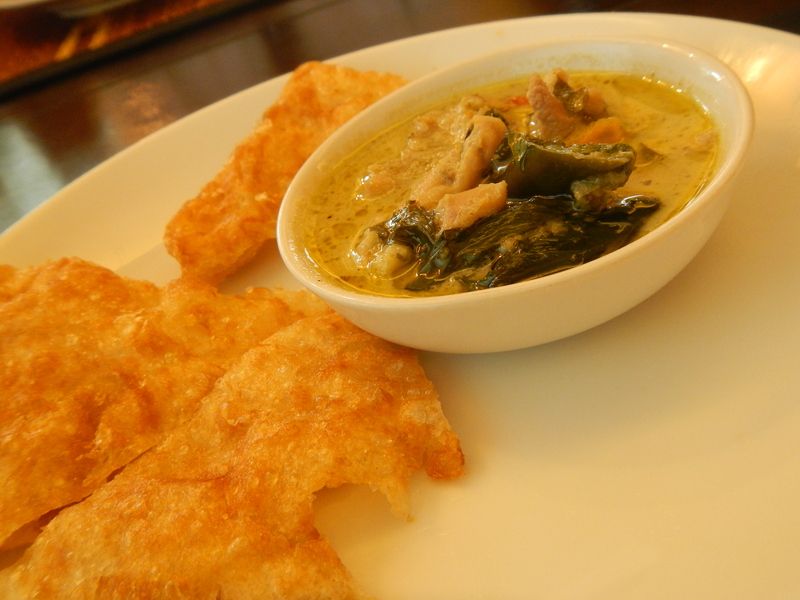 The combination of flavours is delicious, the savoury crunchiness of the Roti melds beautifully with the slightly sweet Green curry creaminess. To finish off our gastronomic tour we had some coconut ice cream, a light and refreshing end. Ginga musings out for now. Tune in Next Time for Bizzarre Biking in Bangkok.